Arista EOS is a lot closer to it’s Linux roots than other network vendors and has left a lot of the Linux host functionality in. It is to the point that if you want, you can drop right down to a bash shell, install packages and modify the underpinnings of the host to potentially match the rest of your infrastructure. Ansible is already in use at a lot of places to manage infrastructure. Arista’s eAPI is a very efficient and effective way to manage EOS which is much quicker than SSH as a transport mechanism. We often enable eAPI to manage the network and not look back for configuration and ongoing operations. SSH + CLI is still needed for troubleshooting and some select operational functions but relying on the API gives us much more agility and gets us more structured data for use. Ansible can leverage eAPI as a transport mechanism. Many cloud scale companies who are already using automation and leveraging Ansible today have embraced Arista as a “cloud friendly” platform. With that, there are a lot of scripts and tooling available out there on resources like Github. This is helpful to get snippets of Ansible code that mostly solve a problem you have which can be modified to meet your needs. 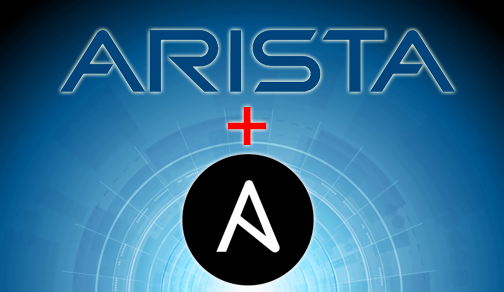 There are teams within Arista and supporting vendors (like WAN Dynamics) who are and have been focused on developing solutions around automation with Ansible and Arista so we all have a great deal of operational expertise around it. It’s sort of second nature for those of us who have adapted to it already. We have been able to leverage resources at Arista for assistance on scripting and getting under the hood to customize the product to suit our customers needs. The support experience is unmatched and very personalized. Believe me, their internal folks are aware of and may be able to lend assistance or give pointers on Ansible scripting. EOS is EOS no matter which model Arista switch you use. The consistency of operating system features and functionality make standardization via playbooks a breeze. For us it comes down to a more modern network operating system and culture fit. Other vendors carry a lot of baggage from traditional models regarding implementation and operations. Arista is cut from a different cloth where automation and orchestration are part of the solution and baked into their design considerations. It’s a modern approach to networking for a DevOps world which Ansible is a key tool within.